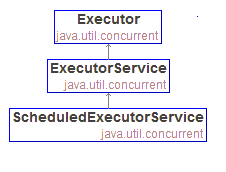 Scheduled executors are based on the interface ScheduledExecutorService which extends ExecutorService interface. ScheduledExecutorService supports delayed and periodic execution of one or more submitted tasks, whereas ExecutorService supports just one time task execution of one or more submitted tasks. ScheduledExecutorService is an convenient alternative to java.util.Timer for scheduling the tasks execution, just like ExecutorService is an convenient alternative to java.lang.Thread. ScheduledExecutorService introduces new methods to create tasks with delays and periodicity properties. Note that ScheduledExecutorService#scheduledWithFixedDelay(Runnable command, long initialDelay, long delay, TimeUnit unit) has different meanings than Timer#Schedule(TimerTask task, long delay, long period), even though both are termed as fixed-delayed tasks in the API docs. The former meanings of delay refers to a fixed delay which separates every two tasks, whereas the latter (please explore details here) refers to rather fixed-delay frequency where delay always starts at the begging of each task executions rather than at the end. All methods in ScheduledExecutorService interface return ScheduledFuture. This interface extends Future, Delayed and Comparable interfaces. Future interface is mainly used to get the results of a Callable results. Delayed interface is used to indicate that this object supports some sort of delayed period. ScheduledExecutorService doesn't define any new method of its own. 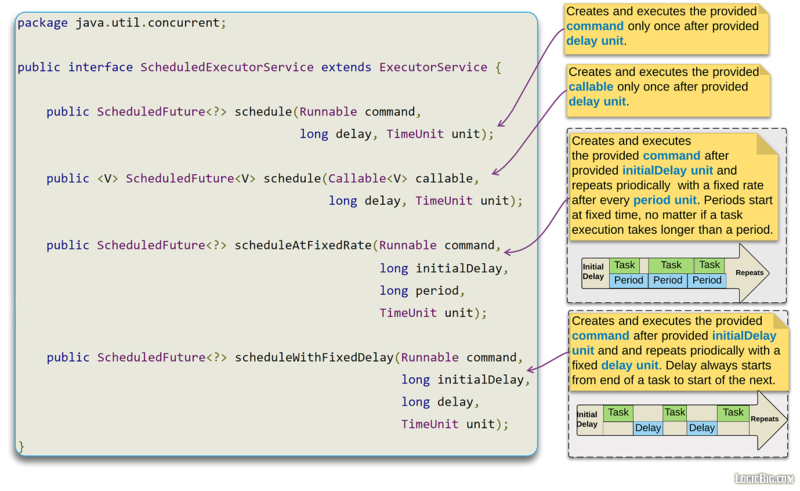 This class extends ThreadPoolExecutor and implements ScheduledFuture. This implementation can run multiple submitted tasks in parallel (the pool concept). If we compare this to java.util.Timer, one Timer instance uses only one thread even if multiple tasks are submitted. So basically all multiple tasks, we submit to a Timer instance, run in sequence to each other but over all execution run in a new thread. 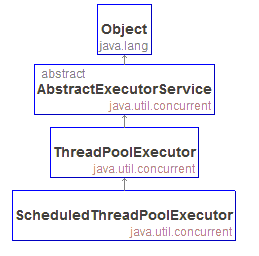 ScheduledThreadPoolExecutor can run multiple tasks periodically in parallel depending on the pool size. This example project includes scenarios where a single task or multiple tasks are submitted to the ScheduledThreadPoolExecutor instance having pool size one or two.